GARDEN STUDIO — Casa & Co. The spacious Garden Studio is the perfect venue for retreats, yoga, corporate team days, workshops and small day weddings and gatherings. Situated in the beautiful expansive gardens of Casa Allegra, you will have use of the gardens and a peaceful verdant view from every aspect of the Studio. The Garden Studio can be booked in conjunction with Casa Allegra to accommodate up to 10 people, or Casa Allegra and Casa Andante can be booked together to accommodate up to 20 people. The Garden Studio can also be hired separately. 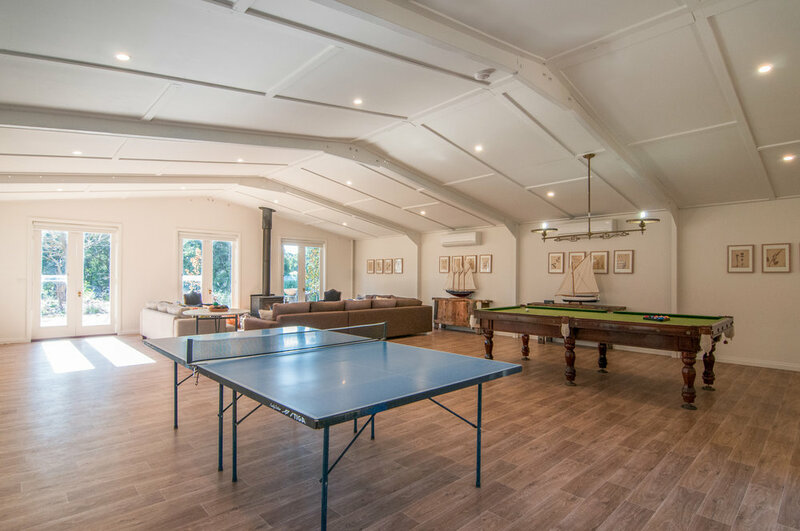 9m x 12m open, light-filled, high ceiling, flexible floorplan space, French doors to garden courtyard with fire pit and seating, billiard table, table tennis, seating 60 max, standing 70 max. “Casa Allegra in combination with Casa Andante provided one of the most ideal settings for our yoga retreat, accommodating 12 students, my teacher from India and me. It was the perfect setting for the work we were undertaking in this retreat – Mindful Self Compassion. The environs of Trentham are a delight, offering beautiful walks and spaces for contemplation, a fabulous bakery at Red Beard, good coffee for those in need and some attractive retail outlets if you want to step outside into the real world.